Behold a surreal image of Mar's moon Phobos above the red planet, captured by the ESA's Mars Express orbiter circling Mars in 2010. Not a drawing. Not an artist's conception. But the real deal! 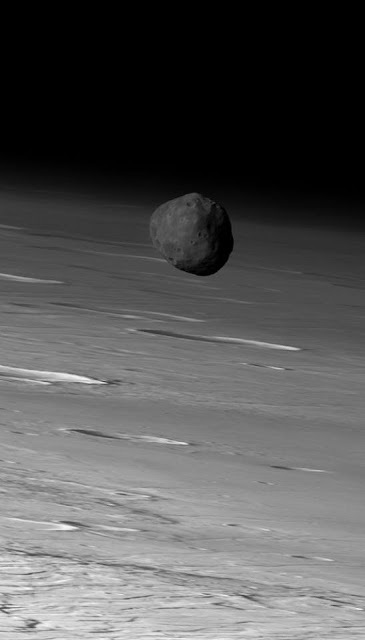 Phobos orbits Mars at a height of about 5,800 miles and has a diameter of about 14 miles, very tiny in comparisson to Earth's moon with a diameter of 3,500 miles. Mars's moon Phobos as imaged above the red planet in 2010 by the ESA's Mars Express satellite with features of Mars below. Mars's features look wavy because of the way the satellite captured this image.